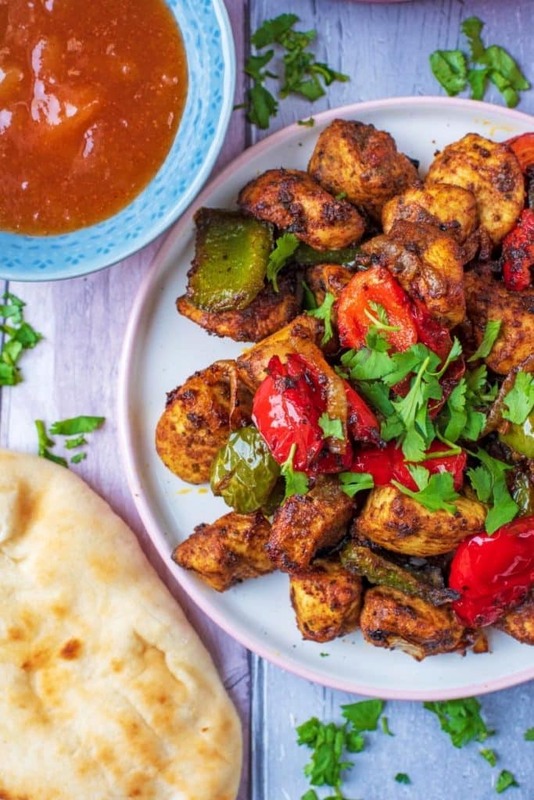 An Indian takeaway classic – this Airfried Chicken Tikka is perfectly cooked chunks of chicken seasoned in tikka spice and served with dips and naan bread for an easy dinner that is ready in just 20 minutes. A great starter for an Indian themed dinner party too. 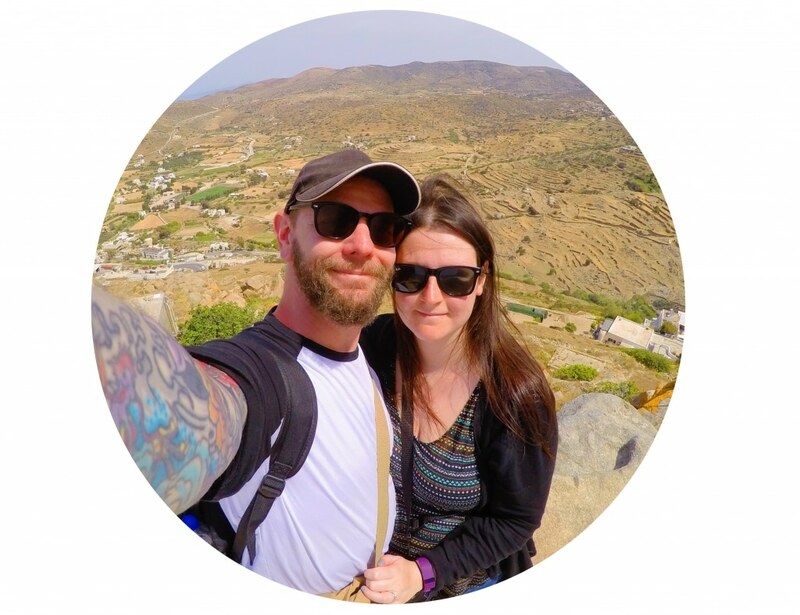 One of our goals for this year was to order less takeaway in a bid to save money, and be a little bit healthier. 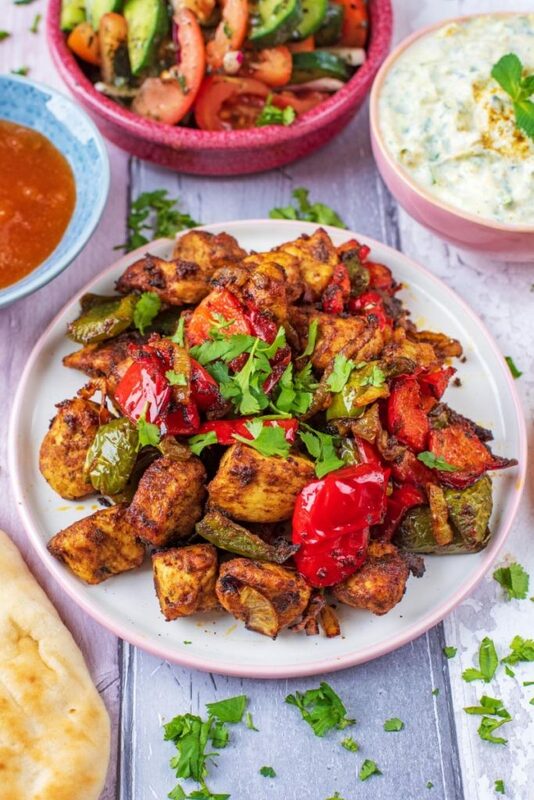 It’s so much easier to stick to that goal when we make our own healthier alternatives to our favourite takeaways and this Chicken Tikka is made every week. It’s a New Year’s Revolution, not a resolution! This chicken is comforting, but still light and healthy thanks to cooking it in our Tefal ActiFry. 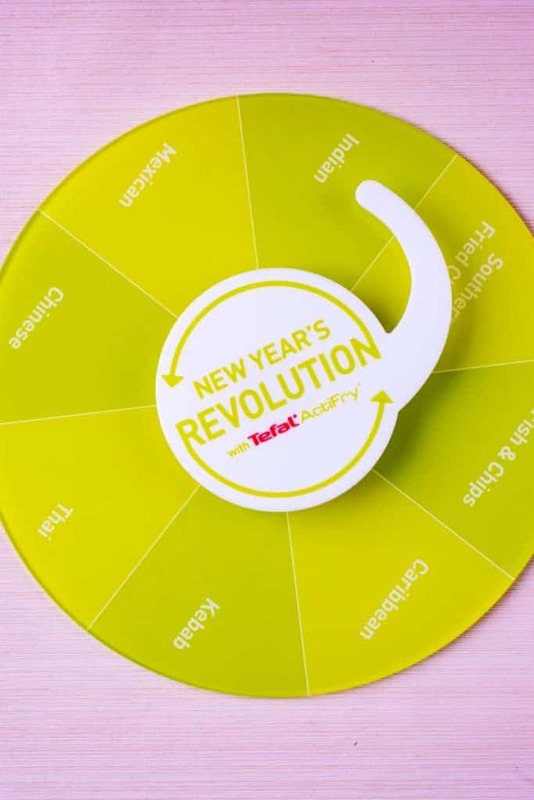 Tefal challenged us to turn an unhealthy treat around as part of their New Year’s Revolution challenge, and we are always up for a challenge. They sent us our very own dinner spinner to choose what meal we were going to create. We just gave it a whirl and it chose Indian. Chicken Tikka was an obvious choice. What Is Air Fried Chicken? Air fried chicken is deliciously succulent chunks of chicken that have been cooked in our Tefal ActiFry – which is one of our most used kitchen appliances. The ActiFry is the UK’s leading low-fat fryer brand, offering you a healthy way to fry. We cook chips in it at least twice a week and they are the best homemade chips we have ever made (using only 1 spoonful of oil you can make tasty, crispy chips with only 3% fat), but there is SO much more you can do in it. 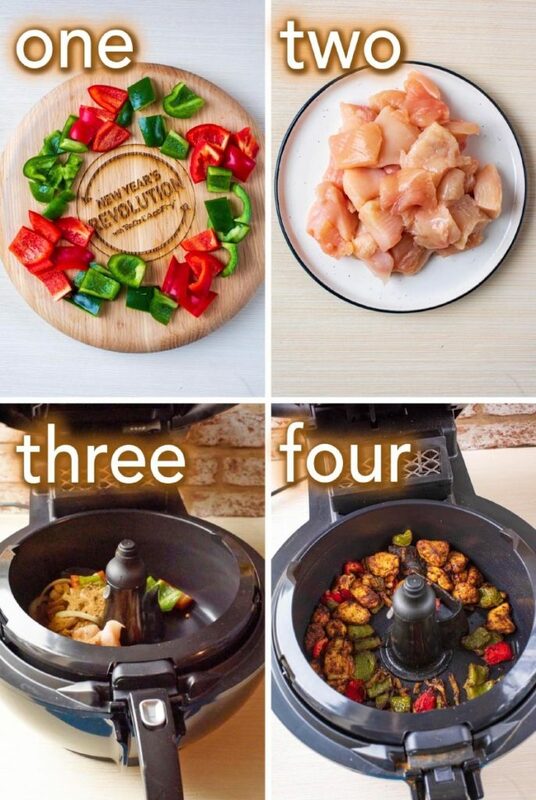 From fries to stir-fries, curries to con carne, the ActiFry stirs up endless mealtime versatility. It can even cook desserts. The unique stirring paddle cooks your food to perfection. Automatic stirring, timing & temperature controls mean no need to constantly stop, shake and monitor. Can You Freeze Airfried Chicken? You can freeze this chicken, however it will be a little dry once defrosted and reheated. It’s so simple to cook in the air fryer, that it’s best to just cook it from fresh. We think this makes a great starter or light lunch, so we served it with some naan bread and dips. We made an easy homemade raita (mint yoghurt) and a tomato, cucumber and mint salad and put some store-bought mango chutney in a bowl. The recipes for the dip and salad will be on the blog soon – they are the perfect accompaniment to any Indian meal. Chop peppers in to chunks and thinly slice onions. Chop the chicken breasts in to chunks. Add the peppers, onion, chicken, tikka seasoning and 1 ActiFry spoon full of olive oil to the ActiFry. Put on setting 6 for 22 minutes. Serve with dips and naan bread. Not a fan of Indian spices? You could use Mexican, or even a mild Italian season blend instead. Make this in to a more filling meal by serving it with some rice as well as naan, dip and salad. Like things on the spicier side? Add an extra tsp of chilli powder to the tikka seasoning. 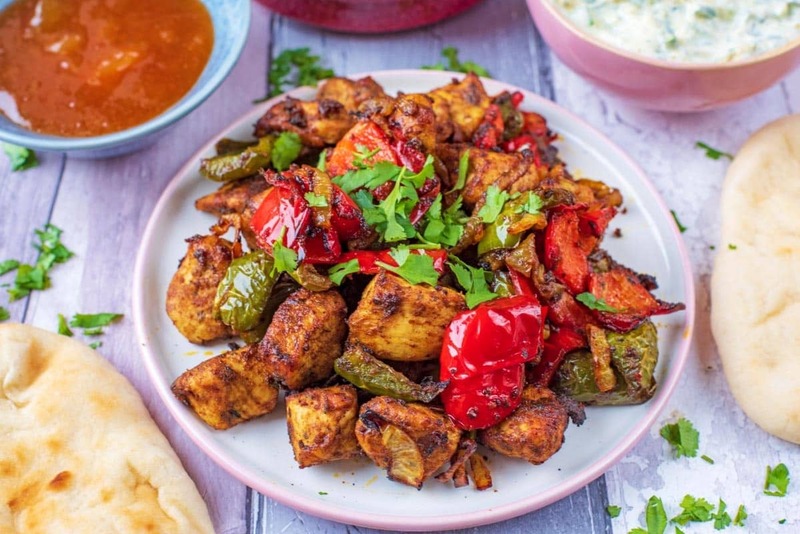 An Indian takeaway classic - this Airfried Chicken Tikka is perfectly cooked chunks of chicken seasoned in tikka spice and served with dips and naan bread for an easy dinner that is ready in just 20 minutes. Chop the peppers in to chunks and thinly slice the onions. Yes, you can still cook it in your ActiFry. Refer to your user manual, and find the setting for chicken breast and use that. It will need to cook for about 20 minutes. 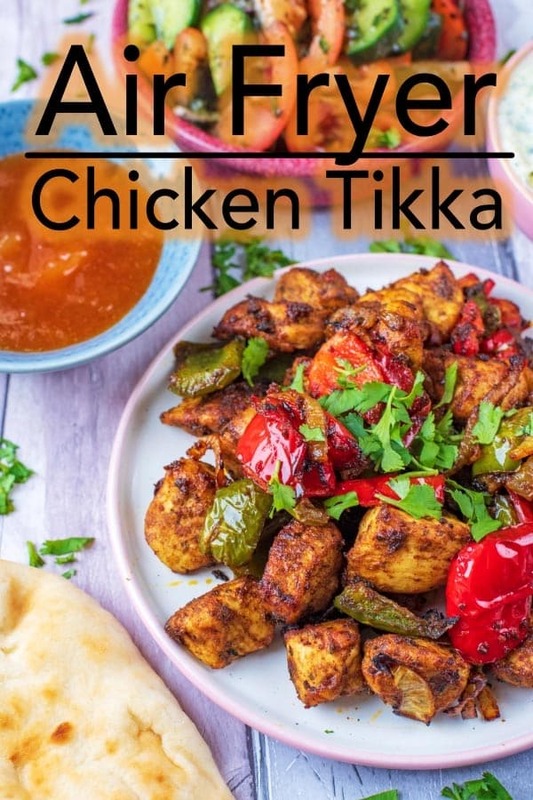 What a great idea to make chicken tikka in the air fryer. It looks delicious! This is super flavorful and I love that it’s made in the air fryer! Great recipe that I’ll be making again and again! wow, you have convinced me that I need an airfryer! I love how you don’t have to use much oil and that chicken looks perfectly cooked! 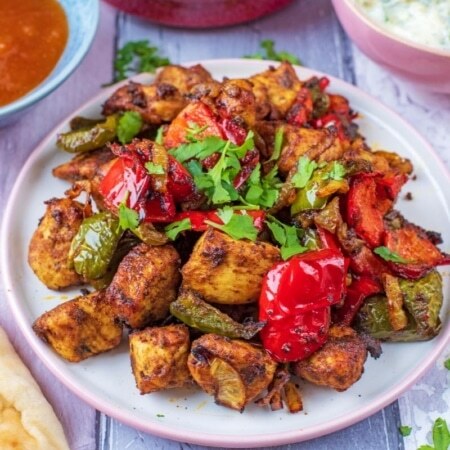 Wow this chicken tikka looks so delicious and so simple to make with the Tefal Actifry, I really need to get me one, dinner sounds much easier to make and no more silly overload of washing pots and pans! And I meant to rate the recipe too, well done! Yum, what a great recipe. I love that this is done in the air fryer and it is a bit of a healthier version. I look forward to giving it a go! Wow that looks amazing!. I have often wondered what to make in the air fryer other than fries and this looks so tasty and doable. I can do this 🙂 This recipe looks like a winner. A dinner ready in 30 minutes is the perfect dinner to me! 🙂 Will be trying soon. I love that you can make this at home! No reason to miss out anymore while staying on budget. It looks amazing. what an awesome recipe. i haven’t gotten an air fryer yet, but def need to. i love the flavors of tikka masala, and really want to make this! 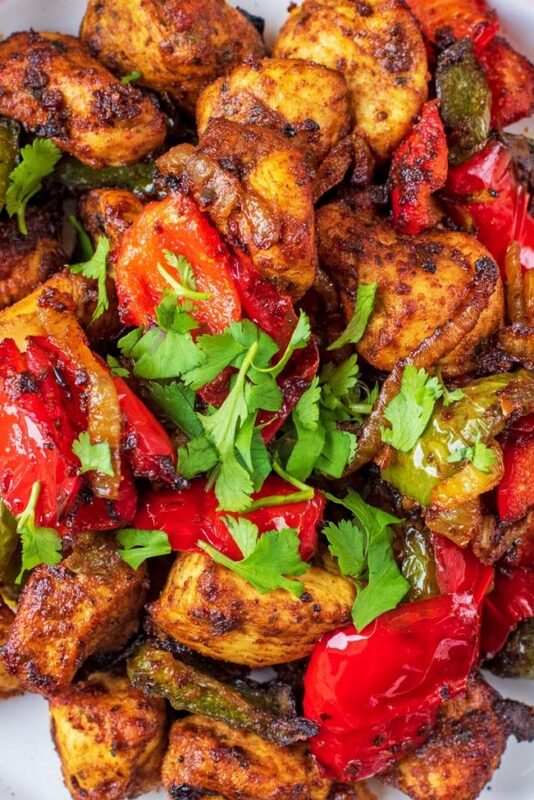 This dish looks so full of flavor and delicious! Love that you used an air fryer for this! This chicken looks delicious! I absolutely love Indian spices. And I just got an air fryer for Christmas, too! I’m still in the honeymoon phase with it, for sure. Thank you for for sharing this. YESSS! I love finding new ways to use my air fryer! I usually use it for side dishes so it’s nice to find a main dish idea!